Douglas Coler played the charismatic CEO Eddy Kammegian in the long running hit play Boiler Room, and appeared in virtually all of the workshop pieces in the first 4 years of AAT's existence. Douglas has performed in radio, television, film, and theatre with actors as varied as Soupy Sales, Victoria Jackson, Martin Sheen, Woody Harrelson, Robin Riker, and Corin Nemec, and once worked as an assistant to Orson Welles. He is the recipient of The Off-Off-Broadway Review Award for Excellence for his work as the alcoholic Harry Grimm in A Chain Of Summer Voices. He interned at the Cincinnati Playhouse-In-The-Park, and is a graduate of The American Academy Of Dramatic Arts/West. 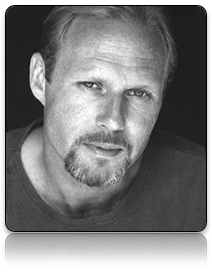 His stage credits include The Lion In Winter, Moonlight and Magnolias, and To Be Let Alone, and many, many others. His film credits include The Sword And The Sorcerer, Longshot, Cold Fire, The Perfect Shadow, and Operation:Dalmatian. He starred as Commander Hank Wyatt in the internet TV series Mars And Beyondon the CyberSci-Fi Network. He appears in a lead role in the feature film from director Mark Tapio Kines, Foreign Correspondents, and he played the role of Dr. Picard, the Gallic Gynecologist, on Days Of Our Lives. Doug lives in the lush and majestic piedmont of North Carolina.